Today in CTE research â€¦ a scan of career pathway models, a peek into employersâ€™ views on competency-based education, recommendations to strengthen the teacher pipeline, and research into the labor marketâ€™s return on investment for higher education. Over the years, the high school reform debate has evolved to view CTE as a means to prepare all students for success in college and careers, and CTE programs are changing along with it. More programs are emerging that blend CTE, rigorous academic coursework and opportunities for career exploration. With that in mind, MDRC researchers took a first-ever scan of the most prominent career pathway models and their underlying principles, the localities where they are most popular, and some evidence of success. At least one career pathway model can be found in high schools in virtually every state and most large cities, the researchers argue, and yet still only a small percentage of students are enrolled in pathways that include the key elements of success. Much work remains to scale programs that are anchored by infrastructure that ensures high-quality implementation, sustainability and continuous improvement. NASDCTEc Executive Director Kimberly Green and Oklahoma State CTE Director Marcie Mack were among the national experts interviewed for this report. teachers as well as how they fare during their first five years in the classroom. In â€œThe Condition of Future Educators 2014,â€ ACT examines which students are expressing interest an education career from administration to classroom teachers, and found that the number of students interested in becoming educators continues to drop significantly â€“ just five percent of all ACT-tested graduates. There continues to be a lack of men and diversity among those who expressed interest in the profession. The study was based on the 57 percent, or 27,000 students, of the U.S. graduation class who took the ACT test in 2014. 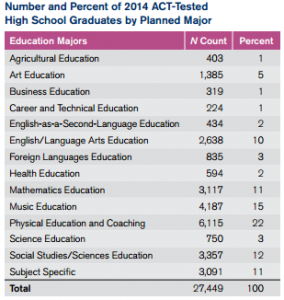 Among the findings, just one percent, or 224 students, planned to make CTE teaching a focus of their postsecondary pursuits. At NCES, researchers provided a first look at the results of a nationally representative study of 2,000 teachers who entered the profession in 2007-08. After five years in the field, 17 percent of the teachers were no longer teaching, the study found. Salary was one of the greatest reasons why teachers remained in the profession. Education level had little impact. Those teachers who started with a $40,000 salary were more likely to still be teaching a year later. Competency-based education (CBE) is gaining traction in communities across the country, particularly within higher education. But what do we know about how employers see it? Two-thirds of employers believe they could be doing a better job of identifying students with the specific skill set required for the job. This entry was posted on Thursday, April 30th, 2015 at 9:40 am	and is filed under Research, Uncategorized. You can follow any responses to this entry through the RSS 2.0 feed. Both comments and pings are currently closed.